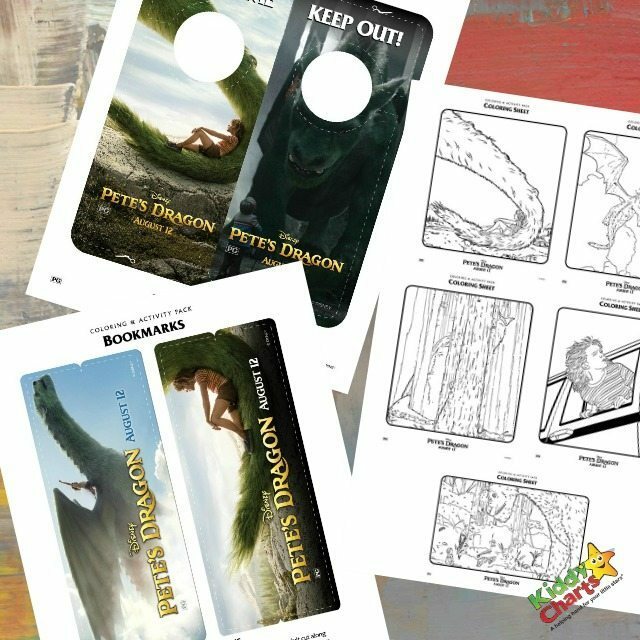 We are sharing some awesome free Pete’s Dragon colouring and activity sheets with you. You and your kids will have lots of fun with these as there’s a colouring page to colour, a bookmark for your books, and a lovely door hangar to welcome, or even to keep people out of your room. Quite a few lovely colouring pages for you and your little ones. Never forget at what page you ended reading last night with these beautiful bookmarks. These are perfect say welcome or keep out of my room. For years, old wood carver Mr. Meacham has delighted local children with his tales of the fierce dragon that resides deep in the woods of the Pacific Northwest. To his daughter, Grace, who works as a forest ranger, these stories are little more than tall tales…until she meets Pete. Pete is a mysterious 10-year-old with no family and no home who claims to live in the woods with a giant, green dragon named Elliott. From Pete’s descriptions, Elliott seems remarkably similar to the dragon from Mr. Meacham’s stories. With the help of Natalie, an 11-year-old girl whose father Jack owns the local lumber mill, Grace sets out to determine where Pete came from, where he belongs, and the truth about this dragon. Disney’s “Pete’s Dragon” opens in UK cinemas on 12th August 2016. You should also check and follow us on pinterest. We have quite a lot of awesome and free printables so you can keep your kids busy for hours and hours and do sign up for our newsletter too, so that you don’t miss out on the other great ideas and freebies that we have for you.